We had a great Easter weekend. Except that I have been sick. Still am. So tired of being sick. UUGH! The kids had fun playing with cousins and eating TONS of candy. 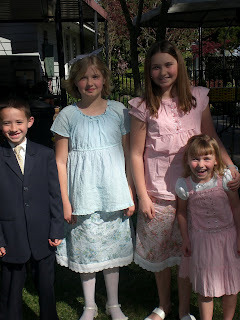 Madeline and Jocelyn sewed their own skirts (well,Grammy Tami helped.) They turned out pretty cute. I hope you all had a wonderful Easter weekend. The weather was beautiful wasn't it?